There is a building located at 1100 Colonial Road. The building sits back off the road. There is a sign that names the place Epiphany Lutheran Church. 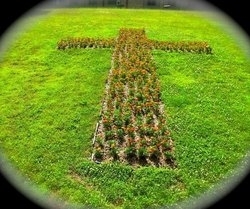 A cross garden is planted on the bank not far from the sign. The property has a large lawn bordered by trees. It is a pleasant enough place among many pleasant places in the area. Yet for many of us, it is so much more. It is a sacred place. It is the place we gather to proclaim that we are God’s people. We worship here. We learn here. We receive the sacraments here. We are married here and buried from here. From here, are lives are given shape. The place has changed over the years. From Sunset Drive to the crest of a farm on Colonial Road to Colonial Park UCC and back to Colonial Road. From house church to new building to ashes to rebuilding and building some more – the place has changed. But wherever the place has been, it has been sacred – it has been the place we have gathered to proclaim that we are God’s people. We too, have changed over the years, though we are still young and old and all that falls in between. We have had our good times and our bad times, our successes and our failures. But whenever and wherever we have been, we have been challenged to make sure that this remains a sacred place – a place where we gather to proclaim that we are God’s people. Fifty some years ago, some people thought this would be a good place for a Lutheran church. That is the beginning of our story. In the next couple of years our place will change again, three housing developments are to be built around us. Things will be different, but our challenge remains the same – to make sure that this remains a sacred place – a place where we gather to proclaim that we are God’s people. The challenge is to be the church, to be Epiphany Lutheran Church. And with God’s help and guidance this will continue to be a sacred place.